With the harsh winter months upon us here in the mountains of west-central Pennsylvania, my research and writing for this family history site have been satisfyingly productive. But, with the fascinating discoveries and friendly internet communications come the occasional bits of bad news. I began a new section just a few weeks ago that I call “Cousins’ Corner,” In Memoriams to dear distant family who have died, leaving me with memories of their rich lives and wonderful work. As in those first instances, it was only chance that had me recall our encounters and the efficiency of the internet that satisfied my curiosity as to their status. So it was with whom I considered a friend and cousin-way-back, Ken Gibbons. I had received an inquiry via my webpage from clear out in Colorado regarding my Fleming family of Venango County, PA. That dear cousin just happened to mention that she had written to Ken years ago on the matter, but that he had died in 2013. After settling with her and making the suggested qualifications to the Fleming pages, I did an internet search on Ken. 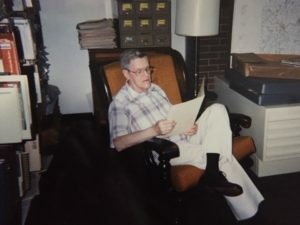 I found only his obituary of June 30, 2013, but it had been posted fondly in several different places pertaining to his family history work in various counties. He surely was well-loved and appreciated by many. Ken was 86-years old when he died, a resident of the Crawford County Care Center. His wife Catherine had died three years earlier. He graduated with a foreign languages degree from what is now Clarion University of Pennsylvania in 1948, the year I was born. His education continued at Middlebury College in Vermont and McGill University in Montreal. He taught French, Spanish, and Latin in at least three different secondary schools as well as English as a Second Language (ESL) to exchange students. As if that wasn’t enough, after retirement Ken taught a course for another decade through Edinboro University of PA at his local high school. He certainly was an educated and giving individual. Naturally, Ken worked also for his church and the Venango County Historical Society. I regret that I never got to meet cousin Ken in person before he passed, but his work will live on in my memory and this webpage.